I see a lot of fancy ‘Family Command Centres’ in blogland and since we’re doing a little less around here right now (well a little less *blogable* anyway) I thought I’d show you mine! 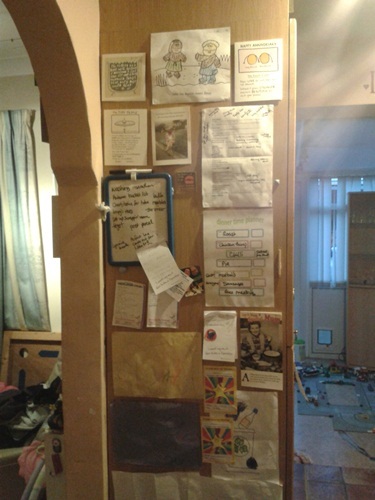 Mind you, I didn’t realise I had a Command Centre, here was me thinking I had a kitchen wall! 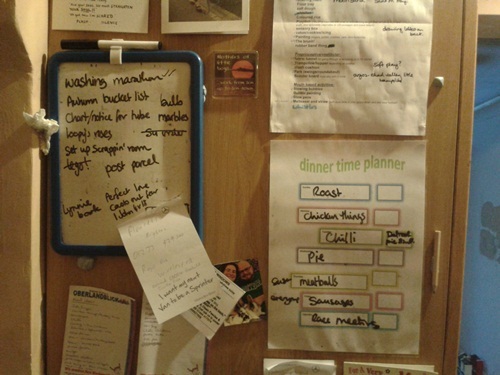 The dinner planner is laminated so it’s wipeclean. The mini white board is from the pound shop. You can also see shopping lists, Oz activity lists, cards, Oscar art etc etc. The whiteboard sometimes has a to do list, sometimes important dates and sometimes a Bible verse or two. Just as the mood/need takes me!